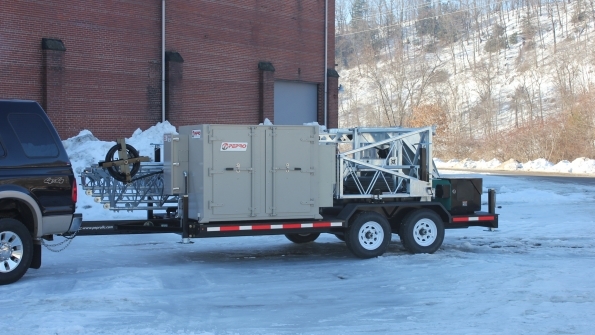 Pepro demonstrates the HCLP-600, a low-profile mobile tower site that can be deployed in less than 30 minutes and features an equipment shelter with the company’s Faraday Cage technology that is designed to withstand a lightning strike. LAS VEGAS—Pepro recently demonstrated the HCLP-600, a low-profile mobile tower site that can be deployed in less than 30 minutes and features an equipment shelter with the company’s Faraday Cage technology that is designed to withstand a lightning strike. The company exhibited the new tower during the IWCE 2015 show last month. Pepro has been developing the HCLP-600 for more than a year, trying to include the myriad characteristics desired by manufacturers and integrators that are interested in participating in the deployment of the FirstNet public-safety LTE system, according to Pepro CEO Victor Garmong. As a result, the Pepro HCLP-600 is transported as a package that weighs 9,480 pounds and measures 8’6” wide, 6’6” high and 16 feet long. However, once at the site, the four-section lattice tower extends to a 60-foot telescoping lattice tower made of galvanized steel, Garmong said. The sections of the tower are positively locked into place while the tower is parallel to the ground, and then hydraulics are used to erect the tower within three minutes, Garmong said. “When it gets to the vertical position, it automatically shuts off—and the same thing happens when you are lowering the tower,” Garmong said. “The other great thing about it is that all of the cables are deployed while it is laying flat on the ground, waist high—you don’t have to climb anything. In addition, because of the existence of the Faraday Cage shelter, the HCLP-600 does not have to be grounded, Garmong said. “You can set it up on a blacktop or cement, and the Faraday Cage protects the equipment inside it,” he said. “If it gets hit with a lightning strike, that protects it, until the strike dissipates. Pepro’s product literature claims that the new mobile tower handles a maximum antenna weight of 350 pounds, but the company recently completed a successful test of supporting a 520-pound antenna from a potential manufacturer partner, Garmong said. Reaction to the HCLP-600 tower during IWCE 2015 was very positive, a fact that Garmong attributed to booth visitors having a greater appreciation for the value of rugged and resilient infrastructure.